Asaf “Asi” Cymbal, of Cymbal Development, is drawing inspiration from a Brooklyn neighborhood as he plans a project along the south side of the New River in Fort Lauderdale. Cymbal has just purchased the Cabi New River site out of bankruptcy for $11.5 million and is drawing inspiration from the personality-driven Williamsburg neighborhood in Brooklyn. The site currently includes the Pirate’s Republic Restaurant, which was once known as Shirttail Charlies. The neighborhood has already started a transformation with new townhomes and a high-rise residential project. Cymbal told the Business Journal he plans to travel the world to determine the best combination of mixed-use elements for the six-acre site, which is adjacent to The Related Group’s three-acre holdings where apartments are being planned. 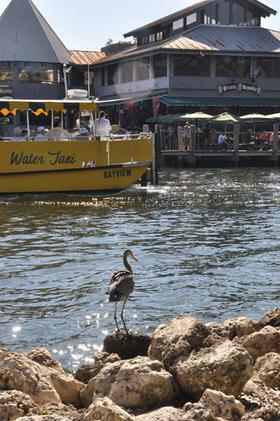 Another neighbor, across the water, is the 245,000-square-foot Las Olas Riverfront retail center, which sold last year to a group that includes Canadian trader Michael Wekerle and hotel investor Dev Motwani. Motwani told the Business Journal that the half-empty property is already undergoing a renovation and plans a repositioning in the marketplace with new long-term tenants. The Riverfront revitalization would shore up activity on the north side of the river, which is near the the city’s historic district, the Broward Center for the Performing Arts and the Museum of Science and Discovery, which in September expanded by 34,000 square feet. The projects by Related and Cymbal – plus a new $273 million county courthouse – could further transform the south side of the New River into a development hot spot. Broward County commissioners are expected to vote soon on a contractor to build the courthouse, the Sun Sentinel reported in mid-December. The Business Journal first reported on the proposed sale to Cymbal on Dec. 1. The background is that Cabi New River, which is managed by the wealthy Cababie family of Mexico, filed Chapter 11 reorganization in December 2010. The company planned to develop a large indoor boat storage facility on its acreage at 400 SW Third Ave. HSBC Realty Credit Corp. had a $17.4 million mortgage on the property. On Nov. 18, Cabi New River filed a motion in bankruptcy court to sell its property to A&C Builders LLC for $11.75 million – with the “C” being Cymbal. The site at its peak was appraised at $31 million and Cabi assembled it for $21.5 million over several years. Cymbal said he has developed approximately $1 billion in real estate in Los Angeles, New York, and Miami. He built and owns Midtown Center, a retail complex on North Miami Avenue, directly across from Midtown Miami and owns property in the Miami Design District. In addition, Cymbal owns a construction firm, and is also a managing partner of several Miami restaurants including Michelle Bernstein’s Sra. Martinez in the Design District. Cymbal is in the midst of raising $100 million in equity for new investments as part of a plan to invest $500 million in South Florida during the next few years.